Whether it is the end of the school year with summer knocking on the door or a visit back to their home country for several weeks, sometimes we have to let our students go. It’s hard. We pour ourselves into our students throughout the year, teaching them, encouraging them, supporting them. Then comes the time when our little birds fly from the nest even if they are scheduled to return to it in a few weeks’ time. What can an ESL teacher do to save her students from the summer slide? From the “if you don’t use it you lose it” of English? From (Oh no, she’s going to say it) ATROPHY? Take a deep breath. It’s not as bad as it might seem. There are plenty of ways to spur your students on to language learning even when they don’t make regular visits to your classroom. Here are some ideas you can try. You don’t have to be a celebrity to have your own website these days. It’s easy to get one and build one, and it doesn’t cost a lot of money, either. The reason I mention this is having your own website can be very useful in the life of a teacher. You can use your website for plenty of things throughout the year, but one way it can help you and your students during vacation time is giving them links to resources they can explore on their own. By designating one page of your website to resource links, your students can have almost unlimited English quizzes, games, and instructions to keep them occupied during the summer even if you don’t write one of them. Plan on investing some time to setting up your resource page, but once you have it set maintaining it will be a breeze and your students will be able to keep their English strong with nothing more than a simple click. You may not be able to meet in the same room as your students this summer (but if you can, go for it), so consider hosting an online book club. If you have an account on Goodreads, you can set one up there. If you don’t have an account yet, take a few minutes on the last day of class to help your students set their own up while you set up yours. Start a group from your account page and then invite your students to join. You can post what book you will be reading as well as have a discussion on a page right there. It’s a great way to motivate your students both to read and to stay connected with you over the summer. Speaking of staying connected with your students, do it. Even if you don’t do a book club with them, keeping in touch does great things for ESL students on vacation. It reminds them of their English goals, it shows them that you care about them as people, which will help them learn better in the coming year, it shows them how English can be useful to them today, and it gets them writing in English when you make your connections via email or text. It only takes a few minutes to send out a line or two to each person, so make a point of keeping in communication with your students if you can. Who doesn’t love an end of the year or goodbye gift? You can put your gift to an English purpose when you put together a selection of things your students might want to read over break. Start a simple collection of reading material including comic books (the first Saturday in May is free comic book day where you can get tons of comics without spending a cent) and books and magazines that friends and family donate. You can also pick up inexpensive reads at a second hand book store or a local thrift shop. Put together a few items for each student that you think they will enjoy, tie a ribbon around them, and send them home with some great reading to keep their skills up to par while they are away from class. When your students aren’t in class, they don’t have to do homework, but that doesn’t mean you shouldn’t assign some. Give your students a fun language scavenger hunt to complete over the summer. You can put whatever you like on your list, but you might want to include some things like these: a book you read, a billboard advertising something you want, a pun you heard or read, a word between jump and kelp in the dictionary, an idiom you heard for the first time, etc. You can tweak your list to best suit your students. Plan on awarding a prize to the winner on the first day of school. Diaries may not be all that popular these days, but anyone can start a blog. And everyone has some interesting things to say. Encourage your ESL students to start their own blog over the summer. At the end of the school year, walk your students through setting up a free blog on BlogSpot or another site. Make a list of everyone’s blog address and pass it out to your students. Then encourage everyone to post something on a weekly basis – whatever they want. And have fun reading and commenting on each other’s blogs throughout the summer. Don’t forget to start your own blog if you don’t have one already and let your students get a glimpse into your life outside the classroom. 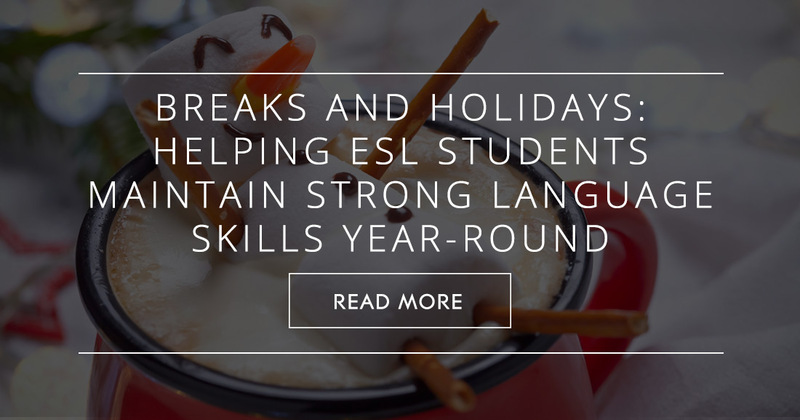 Ultimately, find what works for you and your students to keep their English skills strong over break. Not every strategy is right for every person, but if you can find even two or three that work for you and your kids, you may find that the only slide this summer is the one on the playground.